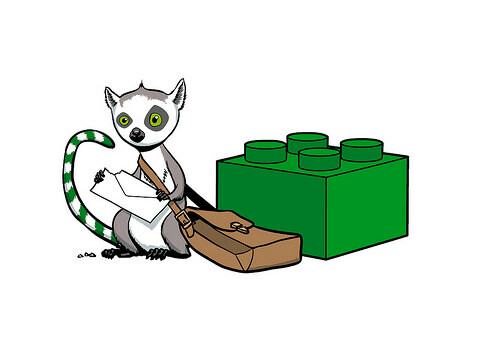 Ask a Lemur – Acronyms, LEGO User Groups and TBB Contributors! Another week has flown by and I am so excited to be able to talk with you again! I am still getting used all the holidays they celebrate here at TBB. American Thanksgiving was this week. The jet was kept pretty busy flying all the contributors back to their homes in time for the holiday. I’ve been told that TBB celebrates major holidays from all over the world. They say it’s part of the job and someone has to do it. It’s nice to see them relax since they work so hard. I was pretty excited about all these holidays but apparently lemur interns aren’t eligible to use the jet. Someone has to stay here to water the plants. Nannan was nice enough to move his collection of carnivorous plants into the hallway outside his office so that I could feed them there. I said that he didn’t need to do that, I was fine just caring for them in his office. He must not have heard me because he just locked his door and ran off to board the jet. Oh, I don’t have to worry about the plants in Mr. Dan’s office either. He is the head of the legal department and is pretty busy all year dealing with the lawsuits. No holidays for him. Besides, his plants are all dead anyway. On to your questions from last week! LEGO fans are fond of their acronyms! Sometimes I think they don’t really want other people to know what they are saying. There are several places you can go to see meanings behind LEGO fan talk. We have our own list here at TBB. There are several others sites as well, such as BrickWiki and Brickipedia. I have to tell you that I was really confused by SNOT. Simon and Chris collaborated on a build a couple of months ago and Carter told me that it had some nice SNOT in it. I didn’t go near that build for days. Now I know that SNOT actually stands for Studs Not On Top. It’s when builders use certain pieces and/or techniques to change the orientation of the bricks. SNOT is actually pretty cool. BURP is another weird one. It refers to a specific LEGO piece that was made to look like a prefabricated rock. BURP stands for Big Ugly Rock Piece. There is also a similar, smaller piece that is called a LURP (Little Ugly Rock Piece). NPU is a newer term and it means Nice Parts Use. It refers to when a builder (usually Sean and Steph Mayo) uses a piece in some new or crazy way that no one else had thought of before. Often the new use is an illegal technique, but let’s not go there again. Iain’s thumbscrews actually do hurt. What are LUGs? I live in Maine, is there one for my state? What do they do? A LUG is a LEGO User Group. There are as many kinds of LUGs as there are LEGO fans. Most LUGs are geographically based, such Lugola (LEGO User Group Of Los Angeles) or SeaLUG (Seattle Lego User Group), while others are based online. Basically all LUGs are groups of LEGO fans who have coordinated themselves in order to share their hobby. Some LUGs revolve around certain kinds of building, such as Trains or Architecture. Others are simply for socializing and/or networking. Is there a LUG in Maine? I have heard of one called MCLUG (Maine Coast LUG). I don’t know if it is still active, but they have a facebook page. You might start there. Hope you find a LUG. They can be a lot of fun! Can you tell us more about how you select [Brothers Brick] bloggers? Cage Match at the TBB compound. Plus half the application is in Latin and the other half is in Swahili. That thins the herd pretty good. Again, thank you for your questions! Please ask more of them in the comments. I’m hoping to get a contact button on the sidebar in the near future, but it might be awhile. Josh is in charge of that and he is taking a long vacation at some place called “Happy Acres”. Andrew said he needed some time to relax and clear his head. Remember, if I use your question next time, you might get some special Lemur Loot in the mail! Just an addition, the granddaddy (or I suppose grandmommy) of LEGO Acronym lists is Shiri’s LEGO acronym FAQ over on Lugnet. Are there any other animals in the Brothers Brick team? Or just a Lemur? How can I help support this most terrific of LEGO blogs so that they can continue to afford to import Madagascarian fruits for their beloved intern? I think that would be “Malagasy fruits” for the intern. Still, knowing this lot, they’d sooner buy more fuel for the jet than tamarind for the intern; that’s what all the mail is for. Speaking of which, is it true that the TBB jet is fully holographically camouflaged, has replaced the pilot’s cabin with a full bar, and is powered by the Eye of Disharmony? Personally I’m just wondering when the intern will get a regular contact link in the nav bar or the Contact Us page. I’ve been wanting to start a LUG in Maine for a while. The Maine Coast Lug doesn’t seem to be very active and the next closest LUG is in Massachusetts. I’d love to connect to the person who posted that question to you. Maybe we can get one rolling up here. Thank you for the articles – they are great. I’ve got a question, why does Josh blog so much more than the other bloggers? This may have been asked before, but how do most of the bloggers come across the models they decide to show on the blog? Do most of them just see them through their Flickr homepage (stuff from their contacts)? Hey Sputnix, I’m of course Tom Miller. I asked the Maine LUG question, do you say you want to START a LUG?! That sounds like a dream come true. I’m not sure if you can get my email from my account, if not, leave me one at shabangalangawang@gmail.com (Yes, that is really it, and yes, I am a childish 17 year old). @Caleb – On Flickr, you should tag your photos with “LEGO” and put them in the LEGO Group. Most of us look in our contacts and then branch out from there. The LEGO Group is where I go next and then I search for the word “LEGO” on recent pictures. After that I run about through the groups of which I’m a part. I’ve been really glad to see that Josh has been able to blog a lot lately, since that means he’s likely not on one of his maniacle 90 hr/week for 6 weeks straight shifts at work. (Though that’s probably nothing compared to the workload imposed on him by evil TBB overlord, Andrew). Glad to have you back for a while, Josh!